Although the design procedure for the HMB and GPB methods for the valve lift profile are different the design process in all three cases is identical. Hence, in this explanation for the HMB method, the same explanations do not have to be repeated for the others. Fig.1 below shows the front page of the HMB method for both input and output data control and the on-screen design procedures one wishes to observe. 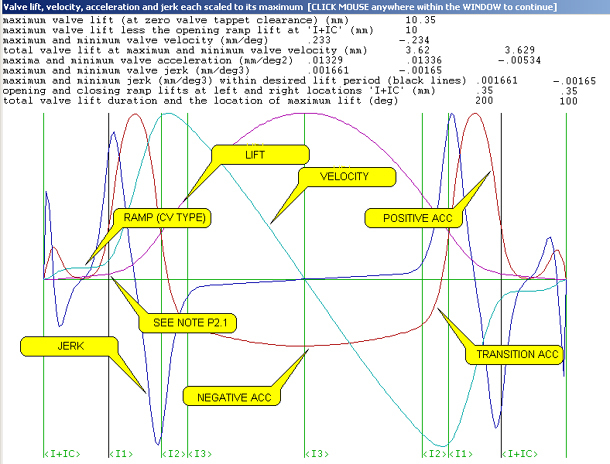 NOTE P1.1: The user can select any one of three types of ramp; cosine being an old-fashioned trigonometric procedure, constant velocity being the most common, and acceleration often effective in racing designs. The ramps at valve opening and closing can be designed to be different at each end. 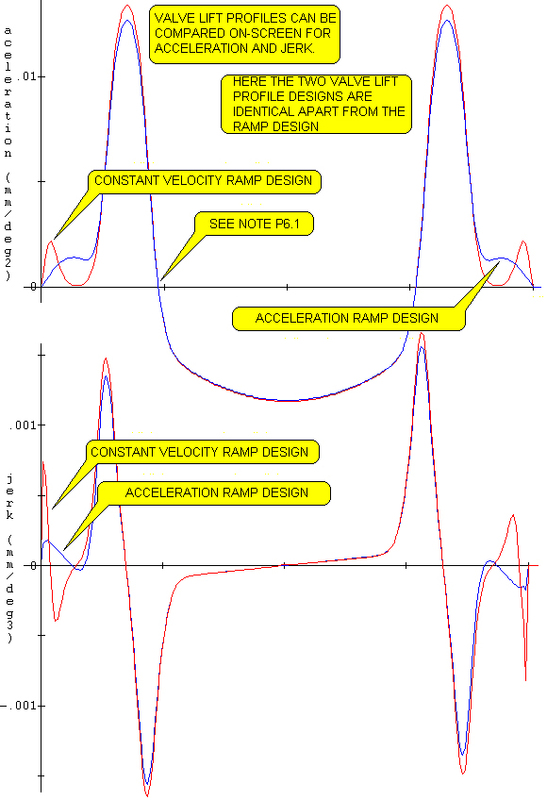 NOTE P1.2: The design is conducted at a camshaft speed as some design criteria, such as ramp velocity or valvetrain dynamics computations, require cycle time as a data input for optimisation purposes. NOTE P1.3: The optimisation of ramp velocity, usually conducted at the highest operational camshaft speed, is normally expressed in terms of a velocity in units of m/s, ft/sec, or even mph! The optimum maximum ramp velocity is typically in the range of 1.0 to 1.5 m/s but this only becomes a logical design procedure if the valve lash selected falls within its operational ambit. The selection of valve lash (clearance) will be discussed below in relation to Fig.4. NOTE P1.4: The user may insert a valve lift and the computation delivers the open-close duration at that valve lift and the aggression of that valve lift profile in terms of the lift-duration envelope ratio, Kld. Aggression is directly related to cylinder filling and emptying for that valve. NOTE P1.5: The user may select up three levels of smoothing of the valve lift profile; this will be discussed in detail in Fig.3. NOTE P1.6: The user may import a previous valve lift profile design and have it directly compared with the current design as the design proceeds this will be discussed in detail in Figs.6 and 7. NOTE P1.7: The 'data info' button contains very extensive 'help files'. This graphic of the valve lift design appears upon a ' calculation'. It is the result of using the input data in Fig.1. The ramp selected is a 'constant velocity' ramp and the flat shape at the ramp mid-point reflects the name; by definition the acceleration here is zero as is the force moving it. The spaces between the vertical green lines are the ramp periods (I or I+IC), the positive acceleration period (I1), the transition acceleration period (I2) and the negative acceleration period (I3); all X and Y data are graphed to scale and any Y data is scaled to its local maximum. NOTE P2.1: The vertical black line is at an angle where the valve lift is precisely 0.35 mm (as selected in Fig.1 at NOTE P1.4). The black line at the right also crosses the lift at precisely 0.35 and the interval between them is 149.99 deg and the Kld aggression level between them is 0.5691 (see Fig.1). Fig.3 below illustrates the quality of the smoothing that exists within the 4stHEAD software . Three levels of smoothing may be selected (see NOTE P1.5). 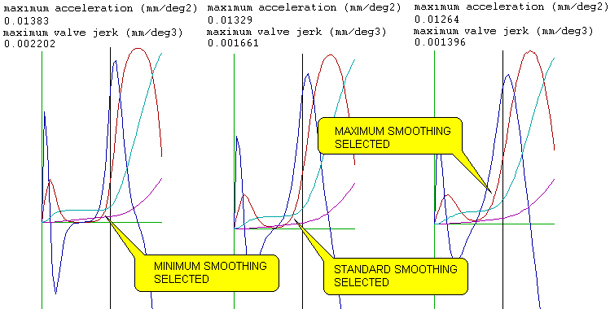 Screen snapshots are given here of using these three smoothing levels (minimal, standard or heavier) and their effect on the maximum acceleration and jerk levels on the valve lift profile. The effect on the shape of the rising positive acceleration curve is quite obvious and the numerical shift of the maximum jerk value is some 50%. Jerk is the rate of change of acceleration, or force, and so jerk is a measure of the high frequency chatter of the valve, valve follower and tappet-cam contact forces. By definition, jerk is also directly related to valvetrain noise and so, while heavier smoothing will be in design use for standard automotive valvetrain design, standard or minimal smoothing will be used for racing engine design. It will be observed that the several levels of smoothing barely effect the maximum values of acceleration. Fig.4 below shows screen snapshots of two differing values of selected valve lift, namely 0.35 mm and 0.2 mm. The black line crosses the lift graph at precisely those lift values. 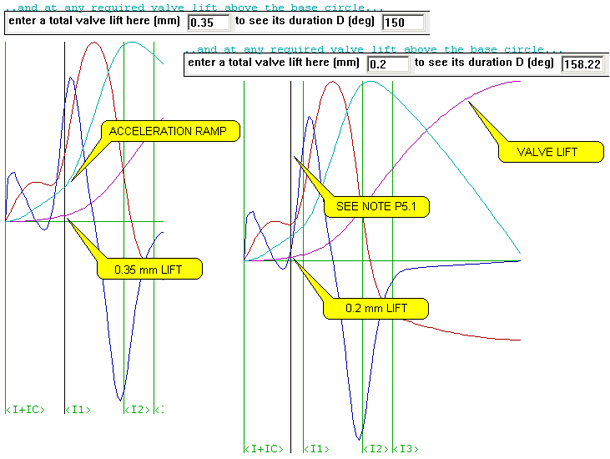 The 0.35 lift value is the value of the designed ramp lift (see Fig.1) and it is rather obvious that the designer would not use this value as the valve lash (tappet clearance) as the black line indexes the jerk curve near its maximum and the acceleration (force) graph at some 25% of its maximum. However, a valve lash setting of 0.2 mm, or some 0.15 mm or 0.006 inch less, lies on the flat of the CV ramp and at zero jerk and acceleration. NOTE P4.1: The designer can change the selected valve lift and, by observing the conjunction of the 'black lift line' and the flat part of the CV ramp, may precisely establish the valve lash and the numerical tolerance for its setting. Fig.5 below illustrates the equivalent discussion to that for Fig.4 with its constant velocity ramp design. Here, in Fig.5, the ramp design has been selected as an acceleration ramp (see NOTE P1.1). The definition of an acceleration ramp is one of linearly increasing velocity and that definition can be seen to be executed numerically in Fig.5. The optimum valve lash setting is still 0.2 mm so as to give virtually zero jerk and 'low' acceleration (force) at cam to tappet contact but the tolerance window of camshaft angle contact to satisfy this criterion is not so wide as for a CV ramp. NOTE P5.1: Hence, acceleration ramp design is normally reserved for racing engines whereas CV ramps can be applied universally. However, short period, low lift, acceleration ramps see significant design application for valve lift profiles with hydraulic tappets. In NOTE P1.6 it is pointed out that it is possible to import a valve lift profile and compare it continuously with a current design as the design process for it proceeds. In this case (Fig.6 below) the imported design is the CV ramp design from the input data used thus far (as in Fig.1) and the immediate design modification is to change both ramps to acceleration ramps with all other data kept identical. 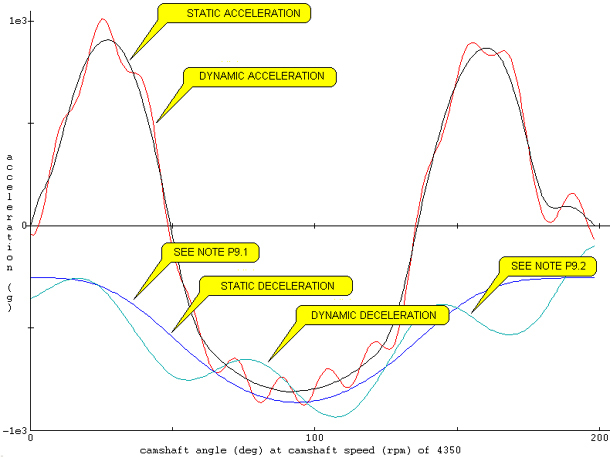 The fundamental differences in the two acceleration diagrams is very obvious as is that for the jerk diagrams. On the jerk diagram, the valve lash location of 'zero jerk' is clearly visible. These on-screen pictures of acceleration and jerk are invaluable during a real design process where one is attempting to improve on an existing design. 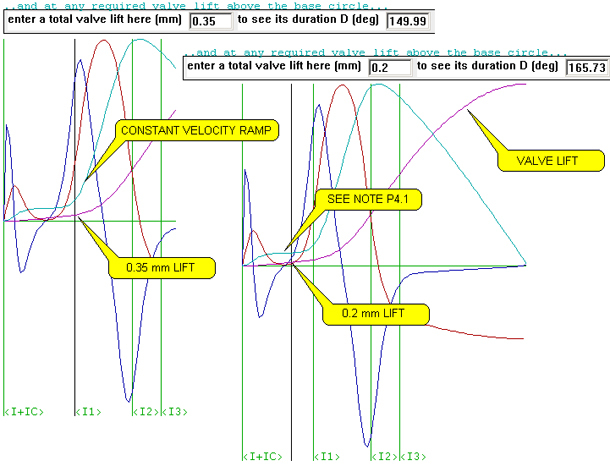 NOTE P6.1: It is interesting to note in this particular case that the valve lift profile with the constant velocity ramp yields higher acceleration and jerk values than that with the acceleration ramp; this is not a universal law! 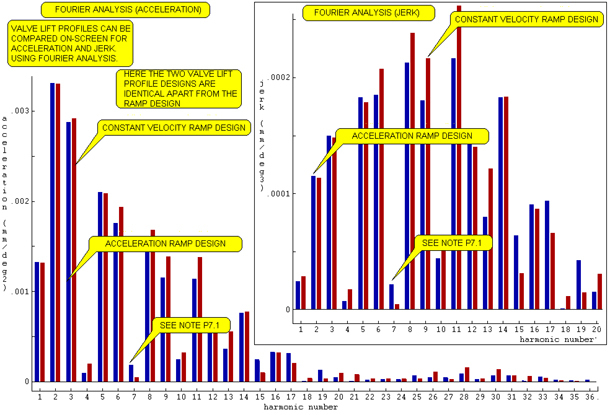 Fig.7 below continues the theme of 'comparison of valve lift profiles during design' where the information conveyed to the designer in Fig.6 is further enhanced by conversion via a Fourier analysis into harmonics up to the 36th. The amplitude of each harmonic is drawn on the two bar charts. NOTE P7.1: It is observed that the 4th, 7th and 10th harmonics have low amplitudes on the Fourier analysis of the acceleration diagram and similarly on the jerk bar chart. At the selected camshaft speed of 4500 rpm (see NOTE P1.2) or 75 Hz (rps), then the 4th harmonic is 300 Hz, the 7th is 525 Hz and the 10th is 750 Hz. Valve springs typically have natural frequencies in the 400 to 800 Hz range and so this particular valve lift profile would be very happy to attempt to vibrate valve springs whose natural frequencies were 525 and/or 750 Hz when the engine was turning at 9000 rpm; with low harmonic acceleration (force) and jerk levels they would be hard to excite into any damaging resonance! On the front input data page, as in Fig.1, it can be seen that a control button exists to 'import valvetrain data'. NOTE P8.1: Superimposed on Fig.8 below is the 'valvetrain data' that one has imported. It is created in fine detail in PROGRAM NO.10 (the specialist analysis for valvetrain dynamics) and exported to PROGRAM NO.9 (cam design and manufacture) because without a static analysis of the dynamic events on cam to follower contact it is not possible to compute the oil film thickness nor the Hertzian stresses. 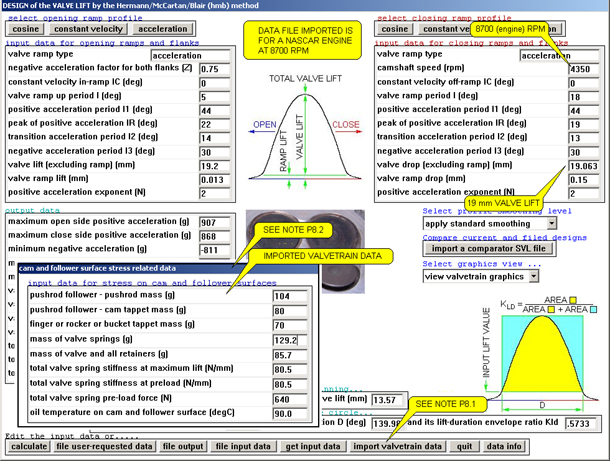 From there that very same force and component mass data can be imported into PROGRAMS NO.1-3 where a mini-dynamic analysis on the entire valvetrain can be quickly conducted to ascertain if the designed valve lift profile has any possibility of controlling the selected valvetrain at the engine speed required. 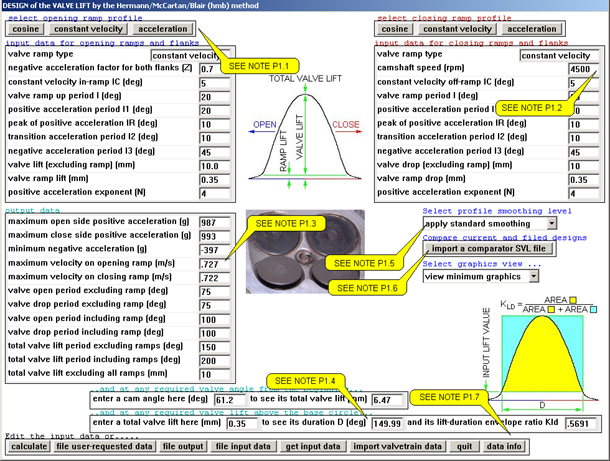 NOTE P8.2: This input/imported data table is actually a screen dump from PROGRAM NO.9 and is not visible when importing the valvetrain data in PROGRAMS NO.1-3 as much more data than this is being invisibly (to the designer) transferred at the same juncture, if applicable., viz rocker geometry, pushrod geometry, or finger geometry, etc. Please note the input data is for a NASCAR pushrod racing engine with a valve lift of some 19 mm running at 8700 rpm. When the design computation is for the current valve lift profile is indexed so too is the 'mini-dynamic valvetrain dynamics' calculation. It is quite complex and takes perhaps 10 seconds to execute on a fast PC; this is in contrast to the complete and extremely detailed valvetrain dynamics computation in PROGRAM NO.10 for the very same valvetrain that might take 5 minutes on the same fast PC. What emerges is the screen graphic shown here for acceleration (g) with static (black) and dynamic accelerations (red) running up to 1000 g for the valve. NOTE P9.1: In several software packages which are commercially available they report that they design the valve spring deceleration (spring preload plus spring stiffness times its compression which force is then converted to a system deceleration) and plot this as the dark blue (static deceleration) line on Fig.9. Their design decision is based on this deceleration being less than the static deceleration at maximum valve lift, as in the case being shown here, in which case they confidently assert that that the valve cannot 'loft'. However, in this case when we plot the dynamic deceleration from the computation (the pale blue line) it can be seen that the valve springs have lost control of the valve just before maximum valve lift and so the valve will loft. NOTE P9.2: Perhaps even worse, after maximum valve lift there is an excess of force (pale blue lower than red) returning the valve to its seat; it may well bounce. In short, for our software competitors to rely on static deceleration for a design decision on dynamic behaviour does not constitute a logical design procedure. Equally, and in the same vein, on the web pages of these same software competitors, or in their technical publications, you do not find valve lift profile designs presented with the same degree of numerical clarity or graphical visibility for their lift, velocity, acceleration or jerk data, nor do you find examples of the quality of the smoothing of their valve lift profiles nor critical debates on optimum ramp design, Fourier analysis, etc., etc.